The tempo of a piece of music is its speed. There are two ways to specify a tempo. Metronome markings are absolute and specific. Other tempo markings are verbal descriptions which are more relative and subjective. Metronome markings are given in beats per minute. They can be estimated using a clock with a second hand, but the easiest way to find them is with a metronome, which is a tool that can give a beat-per-minute tempo as a clicking sound or a pulse of light. 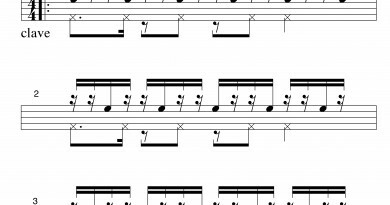 Here are some examples of metronome markings. Metronomes often come with other tempo indications written on them, but this is misleading. For example, a metronome may have allegro marked at 120 beats per minute and andante marked at 80 beats per minute. Allegro should certainly be quite a bit faster than andante, but it may not be exactly 120 beats per minute. A tempo marking that is a word or phrase gives you the composer’s idea of how fast the music should feel. 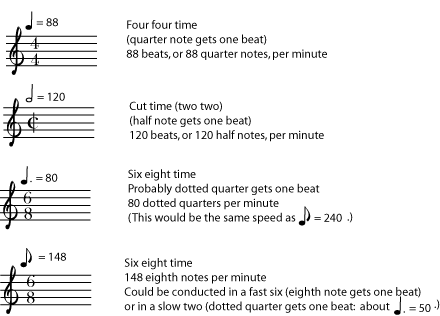 How fast a piece of music feels depends on several different things, including the texture and complexity of the music, how often the beat gets divided into faster notes, and how fast the beats themselves are (the metronome marking). And the same tempo marking can mean different things to different composers; for example, for some composers, largo is slower than adagio; for others, it is the other way around. Traditionally, instructions are given in Italian. These terms, a long with a little more Italian, will help you decipher most tempo instructions. Of course, tempo instructions don’t have to be given in Italian. 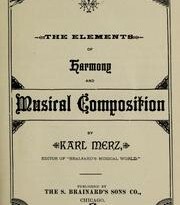 Much folk, popular, and modern music, gives instructions in English or in the composer’s language. Tempo indications such as “Not too fast”, “With energy”, “Calmly”, or “March tempo” give a good idea of how fast the music should feel. If you would like to introduce some of the ideas and terms above to younger students: decide which tempo indications you would like them to learn. Write your chosen terms and their meanings on the board and go over them with the students, or introduce them to the metronome and show them how it works. Choose a simple song (or piece of music if they are young instrumentalists). 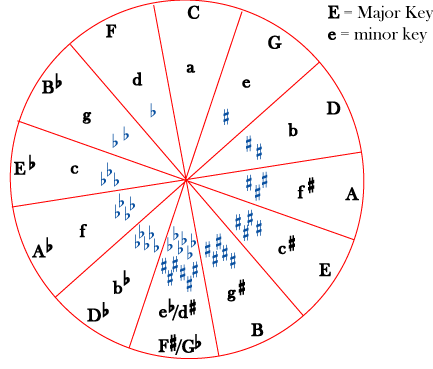 Have them sing (or play) the song at different tempos (allegro, largo, vivo) or different metronome speeds.